China's official military police website recently highlighted the introduction of Chen Taijiquan into the training programme of its officers. The idea behind its introduction is to transmit traditional culture, improve officers physical constitutions and to enrich their cultural awareness and life style when they are not on operational duty. In the time-honoured Chinese way, the movement is encapsulated in a slogan: "Learn Taiji, strengthen the body and spirit, quieten the heart and nurture the body". To get the project up and running, Henan province's military police approached Henan's Chen Style Taijiquan Association and invited Zheng Dongxia to teach them Taijiquan. Zheng Dongxia is a disciple of Chenjiagou Taijiquan grandmaster Chen Zhenglei and daughter of Zheng Guorui one of his senior disciples from the early days. I visited Zheng Guorui's school in Wenxian back in 1997 when his daughter was about sixteen years old and already a competent coach, barking commands at the young students under her charge. Fast forward a couple of decades and it is now the military police being put through their paces. 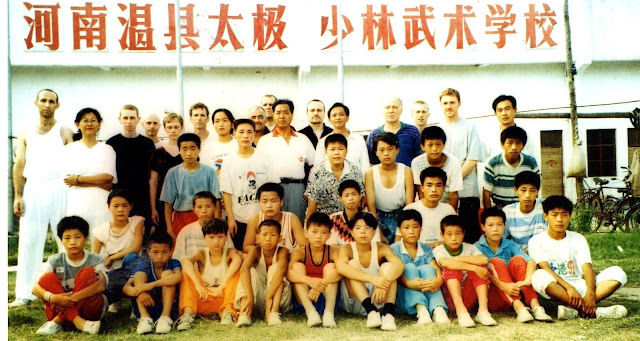 1997 visiting Zheng Guorui's Henan Wenxian Taiji Shaolin Wushu School. Chen Shitong - Chenjiagou's "Taijiquan Hermit"
Wang Juan, a reporter from Wenxian Zazhi magazine was inspired to write about Chen Shitong after meeting him at the recent Chenjiagou Taijiquan Exchange and Competition. Chen Shitong made an appearance after being out of the public eye for many years. People may remember him pushing hands with Chen Xiaowang in an early and widely seen documentary about Chenjiagou Taijiquan. In the film Chen Shitong presented a stocky and powerful figure, but over the last decade he had lived quietly in the village, facing the biggest battle of his life. Under the heading "Taijiquan Hermit" Wang Juan documented Chen Shitong's courageous fight back from serious health problems. Born in Chenjiagou in 1947, like many youngsters in the village Chen Shitong learned taijiquan from his father from an early age. The training was informal and ad hoc until Chen Zhaopi retired to Chenjiagou and began to develop the next generation in a systematic way. Chen Shitong was ten years old at the time and trained alongside future luminaries of Chen Village Taijiquan such as Chen Xiaowang, Wang Xian, Zhu Tiancai and Chen Zhenglei. At the time they studied within the small space of Chen Zhaopi's courtyard, his simple village house doubling up as an informal martial arts school. Sometimes there were between thirty and forty students training there. Chen Shitong reminisced on how fortunate he was to have been able to learn from Chen Zhaopi. Not only was Chen Zhaopi an accomplished martial artist, he was also highly literate and so was able to transmit the theoretical knowledge of Taiji as well as the movement system. With the opening of the new Chenjiagou Taijiquan School in the 1980s Chen Shitong was appointed as one of the instructors tasked with developing the new blood of the village. Chen Shitong told Wang Juan that he never considered himself either privately or publicly as a Taijiquan grandmaster, preferring to live a quiet life and stay "within the soil of his birthplace". While he is modest about his achievements, Wang reported how Grandmaster Feng Zhiqiang, one of the guests at the 1st Taiji Festival in Jiaozuo, commented after seeing him perform that, "It's not only the "Four Jingang" in Chenjiagou, Chen Shitong's Taijiquan is also very good". 2004 was a bad year for Chen Shitong. His father was seriously ill and Shitong looked after him day and night. The illness was protracted and many villagers came to visit. As a result of the exhaustion and worry caused by caring for his father as well as the regular stream of visitors, one day Chen Shitong felt faint and dropped to ground. He was rushed to hospital where he was found to have had a brain haemorrhage. The doctors told him that it was unlikely that he would have survived his illness if it wasn't for his Taijiquan. He had helped a number of people recover from illnesses such as high blood pressure or stroke and he knew that if he was to make a meaningful recovery he was going to have to work hard. His son and daughter were by then good enough to take over the teaching and Shitong began the slow road back to health with the help of Taijiquan. He is certain that his recovery is largely down to Taijiquan. Everyday, very slowly at first, his body gradually became stronger. Chen Shitong's practice was consistent, training outdoors everyday unless the weather was bad. At the interview he tapped his chest proudly and said, "I train everyday. Taijiquan has saved my life! If it wasn't for Taijiquan I wouldn't have survived". Today Chen Shitong has fully recovered except for some residual weakness that affects his movements. He had often thought about how Chen Zhaopi came back to Chenjiagou after retiring to regenerate the Taijiquan practice in the village. He wondered what he could do to carry on this work. A few years ago he mentioned this to his children and some disciples and they suggested that he set up a Chen Style Research Centre so as to pass on his lifetime of Taijiquan realisation. His mind was in a contented place - "my mind is very calm, like a pool of calm water". He is convinced that his life has been saved by Taijiquan and whatever time he has left he wants as many people as possible to benefit in the same way. Chen Shitong's does not want to be in the limelight, but he felt a responsibility to show himself and try to inspire the next generation of Chen Taijiquan practitioners for as long as he can: "If there is a function anywhere I like to be present, to see how the younger people are progressing. Many of the older generation are coming to the notice of the public now as so many people are travelling to the sacred ground of Taijiquan. It's not easy to live like a hermit now!" 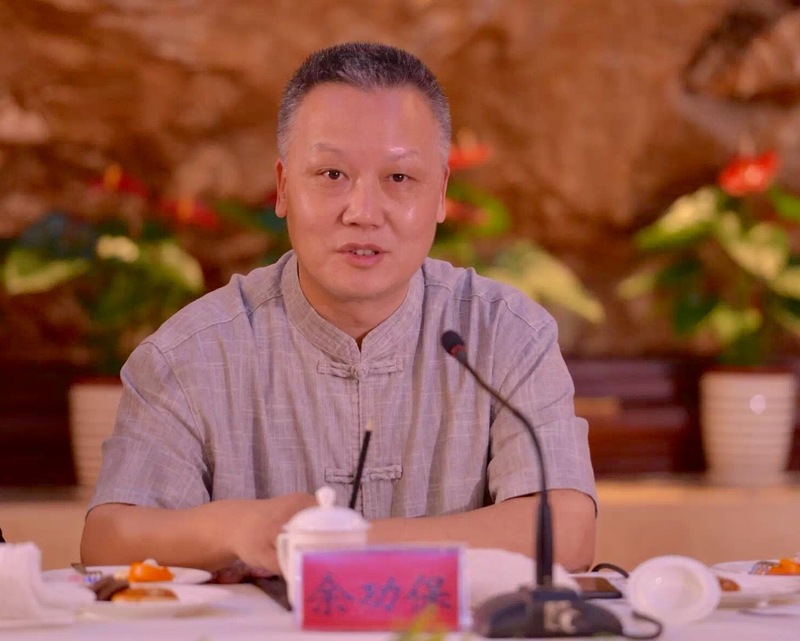 On the 1st March, a roundtable discussion and press conference was held to launch the First World Taiji Culture Festival due to take place from 8-12th April in Sanya’s Nanshan on Hainan Island. The launch was attended by thirty or so Taijiquan experts including representatives of the major families, Taijiquan researchers, historians and people who have dedicated themselves to the promotion of Taijiquan. During the discussion prominent figures in the Taijiquan world discussed some of the issues facing Taijiquan in today’s world and how they could be addressed. Issues raised included: the preservation of the martial aspects of Taijiquan; engaging young people and working towards making Taijiquan be accepted as a “normal” activity like jogging; the need for an elite platform for training and competition; the need to maybe lower standards to draw people into Taijiquan; if change is inevitable, then it must be change that the ancestors could accept; the need for Taijiquan masters to lead from the front in terms of both behaviour and martial skill; how to reduce the complexities of Taijiquan without reducing the quality; integrating the physical and mental – training the body and the mental processes. “The performance of Taijiquan can help to maintain health and fitness, but it is still a “quan” (martial art) and not practiced just for theatre, or exclusively for its health benefits. As far as the quan side of Taijiquan is concerned, it should not lose its practical defensive and attacking skills – so people who practice Taijiquan shouldn’t discard the martial arts element”. “Wu style Taijiquan is a movement principle that requires simultaneous internal and external training. With a lot of elements that involve using qi in combination with Chinese martial techniques to combine jing, qi and shen in order to get the best benefit. Our society is now open and it is our responsibility to let Taijiquan benefit the population”. “Today Taijiquan is very difficult to propagate especially among young people. We should make a success of this Taiji culture festival so that, in China and around the world they know the attraction of Taijiquan. In this way Taijiquan can become a “normal lifestyle” [like jogging in the park or going to the gym]. “Use this platform to have an elite high quality training and competition so that it can spread out. Also use it to emphasise the traditional cultural essence of Taijiquan”. “The most urgent problem facing the ongoing development of Taijiquan is how to attract young people to take part. Also, how to allow the slow method of Taijiquan to change the quick pace of our society….We need to allow the attraction of Taijiquan to be shown to the younger generation through either the web or other modern media. We might even have to “lower the door frame” so people can come in”. To lower the door frame is a euphemism for lowering standards – Zhai’s message is a warning that if people keep clinging to lofty ideals the art of Taijiquan itself may die off. “All of us present have used many methods to propagate Taijiquan. Our reason for doing this is because we want to let a thing we love very much survive. During this process we must not forget what our old ancestors have left. It is through us that it continues to survive. There might be changes, but the changes should be a good change”. “This roundtable conference has assembled some of the world’s leading practitioners – all gathered in one room. So the First Taiji Culture Festival should start from a very high standard in order to set the tone for its future development”. “Taijiquan skill is very comprehensive, so we should not limit it to just its health and fitness benefits. But, we should work to excavate its traditional cultural essence including its philosophy. As Taijiquan’s transmitters our main task is to educate the public and teach our disciples especially in the five virtues (de). In order to do this job well you have to present yourself as an upright person, as well as a good martial artist”. “Cultivating your body and your character – When we train, first on one side you are training your body. On the other we have to nurture and cultivate our character. These are the two sides that have to be done simultaneously. If you just train the body and not the character then there is a lack of balance and sooner or later there will be problems. Likewise, people with mental problems will inevitably find that their body will be affected. So if you can sort out this mental problem, it will have a good effect on the body. So when training Taijiquan, you must have the dual aim of training the body and the mental processes (mind)”. “For Chinese Taijiquan to spread widely all over the world and be embraced by everyone, we have to find a way to be more scientific, standardised and structured”. “To propagate the spread of martial Taijiquan, the most difficult thing is getting across its complexity. The question is how do you reduce the complexities without affecting the overall quality? This is what we need to research and discuss”. “The World Taiji Culture Festival should lie beneath the umbrella of “big Taiji” [and not divide it into styles and families]. All the different types of Taijiquan have different shapes and forms, but the principle is the same. It is like calligraphy. We should put all the commonalities together in order to attract the people into the wider Taiji system”. “The essence of Taijiquan is manifesting the source of your internal body through the external shapes and forms. When you reach a certain level of training you can feel definite and unique changes in your body. These are more than the result of improved health. So don’t lose this essence in the pursuit of competitions and beautiful postures. I believe that people in China, as well as around the world – what they truly want and admire is still the traditional thing that is contained in the internal essence of Taijiquan”. Considering that this is just the preamble before the actual event takes place in April, the First Taiji Culture Festival promises to be a great event. Can’t wait to see the all the papers and presentations from all the different teachers, researchers and historians.